Diorite: This specimen clearly shows the familiar "salt and pepper" appearance of diorite, produced by white plagioclase contrasting with black hornblende and biotite. This specimen is about two inches across. Diorite is the name used for a group of coarse-grained igneous rocks with a composition between that of granite and basalt. It usually occurs as large intrusions, dikes, and sills within continental crust. These often form above a convergent plate boundary where an oceanic plate subducts beneath a continental plate. Partial melting of the oceanic plate produces a basaltic magma that rises and intrudes the granitic rock of the continental plate. There, the basaltic magma mixes with granitic magmas or melts granitic rock as it ascends through the continental plate. This produces a melt that is intermediate in composition between basalt and granite. Diorite forms if this type of melt crystallizes below the surface. Diorite is usually composed of sodium-rich plagioclase with lesser amounts of hornblende and biotite. It usually contains little if any quartz. 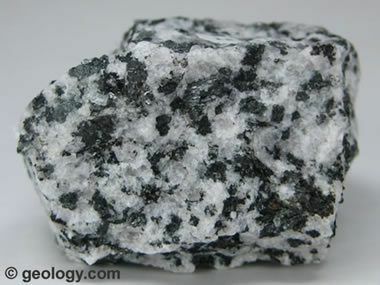 This makes diorite a coarse-grained rock with a contrasting mix of black and white mineral grains. Students often use this "salt and pepper" appearance as a clue to the identification of diorite. Igneous rock compositions: This chart illustrates the generalized mineral composition of igneous rocks. It shows that diorites and andesites are composed mainly of plagioclase feldspar, amphiboles, and micas; sometimes with minor amounts of orthoclase, quartz, or pyroxene. Diorite and andesite are similar rocks. They have the same mineral composition and occur in the same geographic areas. The differences are in their grain sizes and their rates of cooling. Diorite crystallized slowly within the Earth. That slow cooling produced a coarse grain size. Andesite forms when a similar magma crystallizes quickly at Earth's surface. That rapid cooling produces a rock with small crystals. Polished diorite: This photo shows a sample of diorite as it might appear in a polished countertop, facing stone, or floor tile. It would probably be marketed as "white granite" at a cabinet shop or building supply store. Photo copyright iStockphoto / jskiba. Diorite Ax: Photographs of a Neolithic ax made of diorite that was found in the surroundings of Reims, France. It is in the Alexis Damour Collection at the Museum of Toulouse. Creative Commons photographs by Didier Descouens. In areas where diorite occurs near the surface, it is sometimes mined for use as a crushed stone. It has a durability that compares favorably to granite and trap rock. It is used as a base material in the construction of roads, buildings, and parking areas. It is also used as a drainage stone and for erosion control. In the dimension stone industry, diorite is often cut into facing stone, tile, ashlars, blocking, pavers, curbing, and a variety of dimension stone products. These are used as construction stone, or polished and used as architectural stone. Diorite was used as a structural stone by the Inca and Mayan civilizations of South America and by many ancient civilizations in the Middle East. In the dimension stone industry, diorite is sold as a "granite." 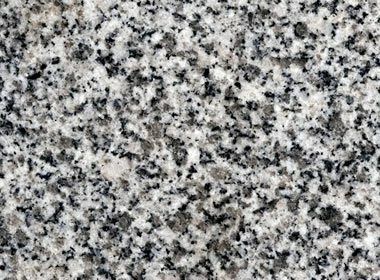 The dimension stone industry uses the name "granite" for any rock with visible, interlocking grains of feldspar. This simplifies discussions with customers who do not know how to identify igneous and metamorphic rocks. 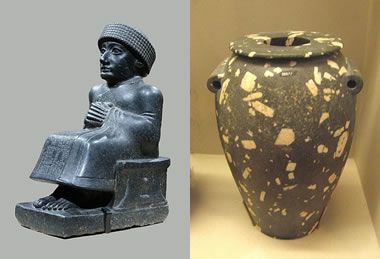 Diorite Sculptures: The sculpture on the left is a diorite statue of Gudea, a Mesopotamian ruler, made in about 2090 BC. It is about 19 inches tall and is currently displayed at the Metropolitan Museum of Art. A public domain image. The vase on the right was made in ancient Egypt from diorite with spectacular feldspar phenocrysts. It is in the collection of the Field Museum. A GNU Free Documentation image by Madman2001. Diorite is difficult to sculpt because of its hardness, variable composition, and coarse grain size. 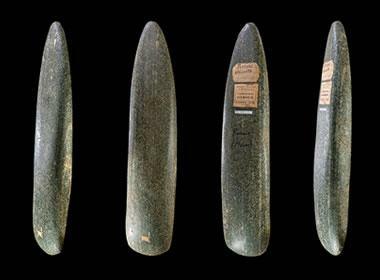 For those reasons, it is not a favored stone of sculptors, although it was popular among ancient sculptors of the Middle East. The most famous diorite sculpture is the Code of Hammurabi, a black diorite pillar about seven feet tall, inscribed with Babylonian laws in about 1750 BC. Diorite has the ability to accept a bright polish, and it has occasionally been cut into cabochons or used as a gemstone. In Australia, a diorite with beautiful pink feldspar phenocrysts has been cut into cabochons and called "pink marshmallow stone." 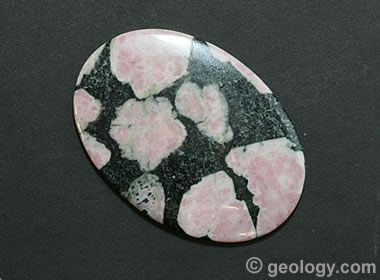 Diorite Cabochon: A diorite in Australia contains large, beautiful pink feldspar crystals. It is often cut into cabochons for use as a novelty gem. It has been given the name "pink marshmallow stone."